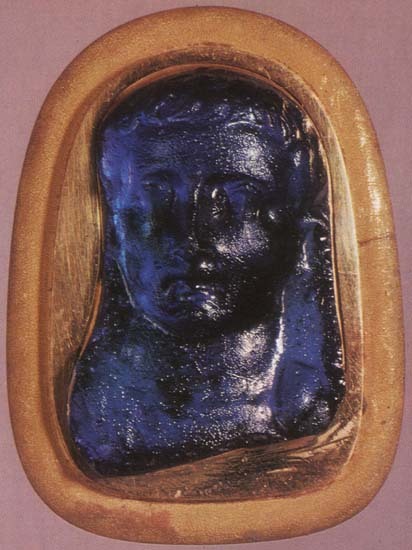 Fragment of a blue glass phalera. 3 × 3 cm. Saint Petersburg, The State Hermitage MuseumInv. No. Ж 272. Acquired from the Casanova collection in 1792. For analogies, see: 1) Rome, Collection of San Giorgi; L. Curtius, Ikongraphische Beiträge, VII, RM, 50, 1935, Taf. 29; 2) Brugg, Vindonissa Museum; A. Alföldi, Römische Porträtmedaillons aus Glas, Urschweiz, XV, 1951, Taf. II—III. © 1971 Photo, text: Neverov O. Antique cameos in the Hermitage Collection. Aurora Art Publishers. Leningrad. 1971. P. 91, pl. 83.